A Senate committee is set to debate a bill ditching the state's new Common Core school standards and stripping the state Board of Education's power to adopt new standards. The Arizona Legislature is set to consider legislation creating a new high school civics test that is a priority for Gov. Doug Ducey. Republican Andy Tobin and Democratic Rep. Ann Kirkpatrick found common ground during a 1st Congressional District debate on protecting the A-10 military jet the Air Force wants to mothball and agreed that Social Security benefits must be protected. Republican Doug Ducey and Democrat Fred DuVal are set to face off for the fifth and final time as each tries to convince voters to elect them as the next Arizona governor. A long-awaited debate in Arizona’s 2nd Congressional District saw Republican Martha McSally and Democratic U.S. Rep. Ron Barber spar over the border and gun control. But the candidates spent much of the debate berating one another for running “false” or “vile” television ads. State Sen. Michele Reagan and former Arizona Attorney General Terry Goddard are set to debate as they vie for votes in the secretary of state's race. The candidates for Arizona attorney general are set to face off in a televised debate. 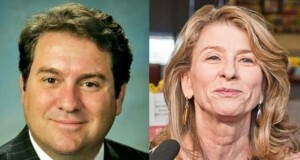 Republican Mark Brnovich and Democrat Felecia Rotellini will debate at 5:30 p.m. Tuesday on KAET's Horizon show. The debate is sponsored by the Arizona Citizens Clean Elections Commission. Republican Doug Ducey and Democrat Fred DuVal had a lot to say about what they wouldn’t do if elected governor, but were short on details on what they would do about some of the biggest issues they’d face as the state’s top elected official.